This is what time spent in your yard should look like. Our specialists will design a proactive lawn spraying program that provides your yard with weed control and soil treatment to keep your landscape beautiful. Our customized residential lawn care services are designed by Oklahoma’s most trusted team of turf experts to make your yard a great place to come home to. 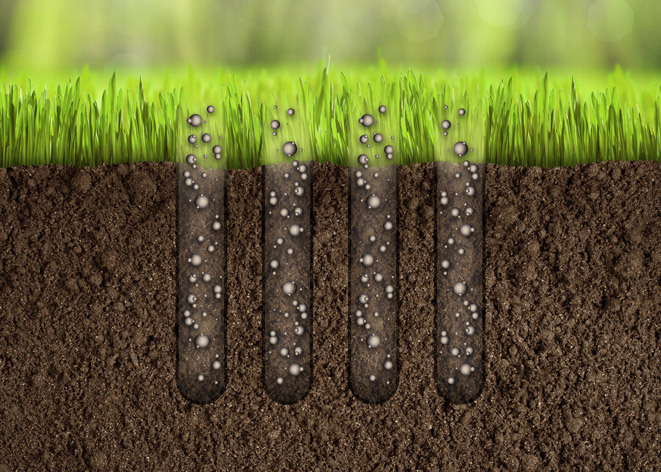 The process of soil aeration creates thousands of tiny holes in the surface layer of your lawn. These holes allow water, fertilizer, oxygen, and other important nutrients to reach the root zone more quickly, resulting in rapid growth and increased root strength development. Aeration also opens up the soil to help reduce thatch build-up and soil compaction, allowing your lawn to breathe and grow with vibrant color and health. Our trained technicians can analyze the health and condition of your lawn and recommend when soil aeration might be right for you. All-Green’s proprietary organic lawn fertilizer and soil conditioner improves the health of your turf in a variety of ways. Over time this green, 100% organic material increases water and nutrient retention, texture, and fertility in general, and also helps fuel the microbial processes vital for healthy soil. We apply it to your lawn in the fall for noticeable results all year long. Tall fescue is the most suitable cool-season turf grass for this region. Since autumn is the beginning of fescue’s growing season, this is the most ideal time to seed. Though fescue is the most tolerant shade grass for Oklahoma’s climate, it requires deep, frequent irrigation during our harsh summers. Even under the best of conditions, some loss can be expected year to year. For this reason, our turf specialists recommend over-seeding fescue areas each fall. The All-Green family of professionals wants to help your family’s holidays sparkle. We custom plan your Christmas light display, take your lights down when the season is over, and even store your lights for you all year long.